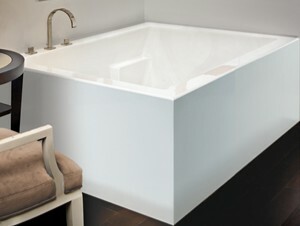 A wide bath, the Andrea 9 offers a roomy rectangle tub. The clean, sleek lines epitomize minimalist design, yet roomy enough for two. Features integral armrests and a flat rim. Drop-in or undermount installation. Options include tile flange and skirting for alcove bath or freestanding with Sculpted Finish. Choose your perfect bath: Soaking Tub, Heated Soaking, Stream Bath, Microbubbles, Air Bath, Whirlpool or Combo Whirlpool-Airbath. Tub Size: 66.75" x 49" x 20.75"
Bottom Interior: 44" x 31"